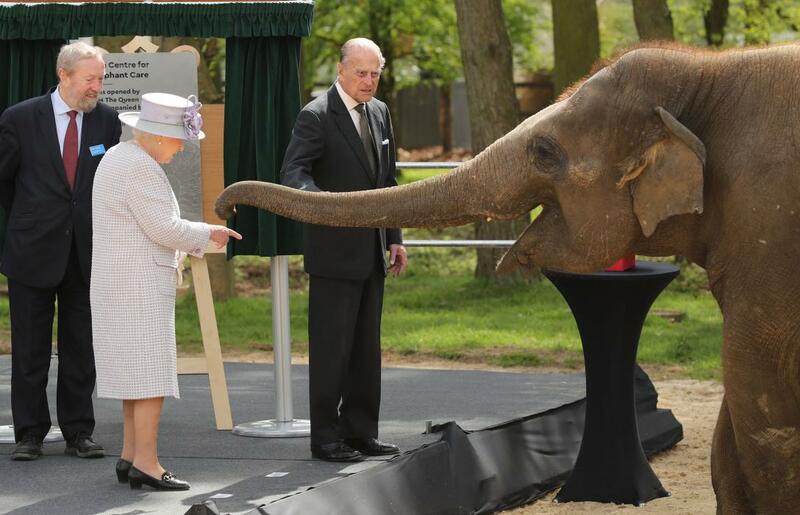 The Queen, accompanied by The Duke of Edinburgh, visited Bedfordshire on 11 April 2017 to open the brand new Centre for Elephant Care at ZSL Whipsnade Zoo. The trip also included the opening of Priory View – Bedfordshire's new independent living scheme for older residents. The Queen began the day meeting zookeepers and architects of the award-winning centre for elephants. The new facility, which stretches out to 20 acres of rolling paddocks, becomes home to the zoo's herd of Asian elephants. Asian elephants are classified as endangered on the IUCN's red list of Threatened Species, with their wild populations in danger due to habitat loss, human conflict and poaching. Charity ZSL runs more than 50 conservation programmes worldwide. Currently in Thailand – a major stronghold for Asian elephants – the team are focusing on reducing human-wildlife conflict and ensuring the peaceful coexistence of elephants and humans. In the afternoon, The Queen and The Duke visited Priory View – the first housing scheme of its kind in central Bedfordshire. The complex has 83 self-contained apartments designed especially for older residents. The scheme allows people to live in the privacy of their own home while benefiting from the support of a lively community. The site has a shop, spa, café and gym and a range of social clubs and activities to enjoy.